Autogrill SpA reduced the weight of the triangular plate in a paper-plastic composite. The packaging was lightened by 11% by reducing the thickness of the cardboard layer. The intervention also included the use of 100% recycled materials for the production of the cardboard layer. 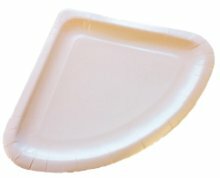 The barrier effect between the plate and food is guaranteed by a layer of OPP film (oriented polypropylene). The company has been certified in accordance with standard UNI EN ISO 14001 and EMAS since 2007. Lightening the packaging bulk resulted in a reduction in environmental impact due to savings in raw materials and end-of-life management, with direct effects on all the indicators under consideration. In addition, the use of post consumption recycled materials further reduced the environmental impact per single product, in particular water consumption.